Spacecraft structural health-monitoring applications are pushed forward by increased constraints in the cost of launching payloads into orbit that dictates major reduction in structural weight only attained through the use of advanced materials and innovative manufacturing methods. On the other hand, the reduction in structural weight must be tempered against the increased demands on performance, damage tolerance, and lifetime durability . The present paper introduces a demonstrator that shall perform temperature measurements by means of Fiber Bragg Grating (FBG) optic sensors. The aim of the work being undertaken is, on one side, to demonstrate the advantages of using this technology with respect to present temperature monitoring techniques in both telecom satellite and launcher applications, and on the other side to reach the TRL-5 Technology Maturity for Crisa and FiberSensing. Towards this goal, several optoelectronic components are being tested following space requirements in order to be integrated as part of the FBG systems under development. These pre-validation tests are being carried out in collaboration with ALTER Technologies, and are meant to de-risk the full system development plan from the early design stages. This paper presents a description of the system focused on the use of optical components. The Fiber Optic Sensing (FOS) system under development is a measurement system composed by FBG sensors, optical harness and an interrogation unit, whose interfaces are compatible with the existing thermal monitoring system so it can be used as a replacement for the latter. FOS technology can be used for measuring other analog parameters (strain, displacement, acceleration, inclination, pressure) using the same interrogation unit, by adding different types of FBG sensors. 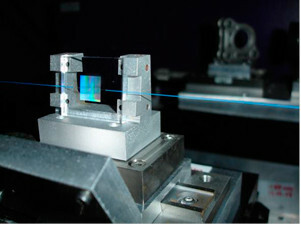 A fiber Bragg grating is a small size microstructure (less than 10 mm long) that can be photo-imprinted in photosensitive optical fibers by side-exposure to patterned UV laser radiation. The interrogation unit includes a group of function called FOS CONTROL and another called FOS OPTICAL, which correspond to separate Printed Circuit Boards (PCBs) of the FOS demonstrator. FOS_CONTROL: This assembly includes basically the electronic functions of the unit, except those that due to the very restrictive constraints and the intimate relationship with the optical elements of the system need to be in close proximity to them. FOS_OPTICAL: This assembly includes all the optical components, plus those electronic functions that are required to stay in close proximity to the optical elements affected by them. The focus of the architecture for the demonstrator in the present project, however, is not on the internal interfaces of the RTU2015 (TM/TC and power), which are considered standard technology, but on the parts of the FOS system that deal with new photonics technologies. However the mechanical design considering this as a RTU2015 module has some impact on the mechanical tests. Therefore the vibration and shock tests were performed with the samples mounted as in the final application. The optical components are considered the most critical ones in terms of space environment suitability . For this reason a preliminary selection of components has been done including a pre-validation of those considered as the most critical among them. Other optoelectronic components which are also used within the system, such as photodetectors, couplers or connectors have been considered to be at a greater TRL and are thus not being tested. The samples were submitted to sine and random vibration as well as SRS (Shock Response Spectrum) shock ests according to ECSS 10-03 standard. The samples were mounted on a PCB in the same way they would be mounted in the final application. The main optical characteristic of each optical component was monitored during the vibration tests or they were measured before and after (this was the case of the tunable filter). In the same way the components were characterized before and after the SRS shocks. The following picture shows the setup used. OADM Mechanical Test: No variation of the reflected or passed optical power was measured. Tunable Filter Mechanical Test: The filter was measured before and after the vibration tests and no degradation was observed. Etalon Wavelength Locker Mechanical Test: The wavelength locker at quadrature point was monitored during the vibration tests and measured before and after the shock tests. No eelevant variations were measured. 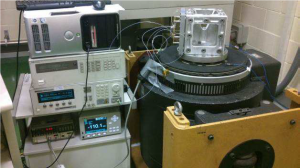 VOA Mechanical Tests: The variation of the attenuation during vibration was less than 0.5dB. Note that the tested components are MEMS and therefore, there are moving parts that could be affected during vibration. However these components showed good mechanical properties. The sensor packaging is based on an alumina substrate, providing a high Young modulus for strain decoupling. This allows for the consecution of a small form factor (20 x 6.35 x 2mm) and low weight (1gr) sensor, while providing easy handling and good mechanical performance. The results obtained are very promising for the implementation of an Interrogation Unit for FBG sensors to be space validated. The main problems encountered were related to radiation of a component that is known to have a radiation resistance version. However not all the critical components have been tested yet due to delays of the manufacturer of the SOA.